A couple of commentaries I saw this past weekend helped to remind me of the things that God used to help me escape Evangelicalism and become a Confessional Lutheran. 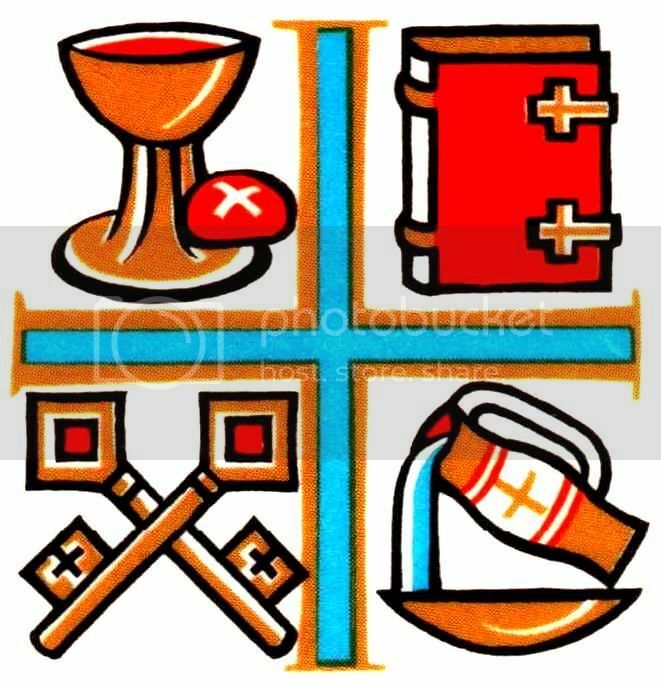 Similarly, these are the very same things that help to make Lutherans uniquely different from any other confession of "the faith that was once for all delivered to the saints" (Jude 1:3). Don't get me wrong. Some of those activities can be good things. The problem is there is no Jesus there. And if He is there at all it's only as a distant helper who helps me do more and somehow grow closer to Him. What I need is a Savior. What I need is the life, death and resurrection of Christ that happened 2000 years ago FOR ME and my sins of today. I can fast or meditate on Scripture for hours, days, years, and still not find the forgiveness of sins FOR ME. Is my repentance genuine? Am I really truly sorry for those sins I committed? Am I acting Christian enough? Am I growing closer to God? Penitential reflection left to itself leads to despair. No matter how much I look into myself and repent of my sins, no matter how much I reflect on the sufferings of Christ, there is still no Jesus FOR ME. Remembrance doesn't give me Jesus. Repentance doesn't give me Jesus. And the more I look into myself, the worse it gets. I remember this as a very sad reality for many people I knew growing up. Older people who had been in church for years would not take the Lord's Supper because they felt unworthy. They knew all the theology, read their Bibles and prayed daily, knew all the works of Christ, His dying and rising, but they could not be certain they were part of the elect. They felt too sinful, hadn't repented genuinely enough or seen enough fruits in their lives. They abstained from the Lord's Supper so as to not eat and drink in an unworthy way. How sad! They had misunderstood the Lord's Supper and turned it into yet another act of devotion rather than the pure gift of the true body and blood of Jesus given to sinful beggars. What brought me to Lutheranism was it's Biblical understanding of the means of grace. As Martin Luther said: "If I now seek the forgiveness of sins, I do not run to the cross, for I will not find it given there. Nor must I hold to the suffering of Christ as Dr. Karlstadt trifles, in knowledge or remembrance, for I will not find it there either. But I will find in the sacrament of the gospel the word which distributes, presents, offers, and gives to me that forgiveness which was won on the cross" (AE 40:214). There I found true comfort and certainty! The Lord's Supper is not some mental act of remembrance of Jesus and how He once lived, died and rose again. The Lord's Supper is where I come as a beggar and am nourished with the gift of His true Body and Blood, shed for the forgiveness of sins FOR ME. In this Sacrament, Luther affirms, "Christ takes me and devours me and gobbles me up together with my sins. I partake of his righteousness such that His godliness swallows up my sin and misery so that I have nothing but righteousness" (All become One Cake: A Sermon on the Lord's Supper, 15231). Lent is a time of penitential reflection indeed but no amount of reflection, no amount of reading and meditating on Scripture, no amount of fasting brings me Jesus and His forgiveness. I get all of Him in the means of grace. So what better way to do Lent than to, as Dr. Norman Nagel once said, "Best way to celebrate Lent is close to the means of grace, rejoicing in our Baptism, rejoicing in the body and blood of Christ given and shed for the forgiveness of your sins." Isn't that what we just prayerfully considered in the Lenten sermon about Judas from the other day? So, we Lutherans are different due to our Biblical understanding of the Means of Grace among many other things. That brought me to another Lutheran layman who also wrote about these critical differences between Lutherans and other Christians as he reflected on his transition from a Reformed/Presbyterian background to becoming a Lutheran. He highlights the Means of Grace too, but goes further by identifying nine different marks of distinction. Certainly take some time to read his entire list, but there's one item he calls attention to that I want to emphasize here since I have found it to be the most glaring (and comforting!) difference next to the Means of Grace. Of course, that isn't an exhaustive list, but it's a great place to start for anyone who wants to begin an honest and serious discussion about the things we Lutherans believe, teach, and confess and why we hold to such truths so faithfully. As mentioned in the above piece, "after reading this article, you will realize the challenge that Lutherans do not fit nicely into a box with Baptists, Methodists, Presbyterians, Evangelicals, etc." Indeed. Now, for those who may be thinking that we are somehow suggesting that a person cannot be a Christian or cannot be truly saved unless they identify themselves as Lutheran, that's simply not the case at all. Caring about doctrine requires Christians to engage in the difficult and painful task of making distinctions between church bodies. Why am I a Lutheran? Well, I can tell you that it's more than mere "tradition." The short answer is because it's the most Biblically sound confession of faith on the planet. I didn't think that just a few years ago (I went through a phase were I thought ALL churches and denominations were apostate, blasphemous, and heretical), but today I wholeheartedly and most certainly do believe that Lutheran doctrine is consistent with Christian doctrine. For an ex-Evangelical like me, however, who is only recently coming to appreciate the "Means of Grace" (a.k.a. the preaching of God's Word; Baptism; Lord's Supper), I have to say that this is what I've come to crave the most from Lutheran preaching and teaching -- Jesus, Jesus, and more Jesus! You'd think that Christians from any denomination would be focused on Christ, but I'm here to tell you that that's just not so these days. In a Lutheran layman's terms, all of these things help to remind us why we identify ourselves with Martin Luther, and it all has to do with God's grace and the fact that it's because Jesus is always at the center of anything and everything we preach, teach, and confess. Even Luther himself knew that when he wrote, "The first thing I ask is that people should not make use of my name, and should not call themselves Lutherans but Christians. What is Luther? The teaching is not mine. Nor was I crucified for anyone. How did I, poor stinking bag of maggots that I am, come to the point where people call the children of Christ by my evil name?"